• Derek's original title for the book was Blue Burt's Bluff because Blue Burt and Wiggles try to "bluff" mother nature. 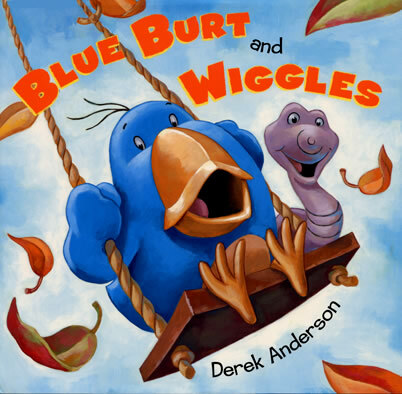 But Derek's publisher decided the title was too difficult to pronounce so it was changed to Blue Burt and Wiggles. • Wiggles is a character that dates back to the late 1980s. Derek drew a comic strip for his college newspaper called "High Tide" about a group of fish that lived in the ocean. Wiggles was a worm that hung on a fisherman's hook and talked to the fish. The worm's name was borrowed from Derek's college roommate, Mike Wigton, who went by the nickname Wiggles. • Derek also had a nickname in college- everyone called him D-Rok. • In early drafts of the story, the main character was a bear and there wasn't a worm character at all. But as Derek shaped the story, he soon realized that friendship would play a key role in the book. And a bird that would need to migrate worked much better than a silly old bear. • Two bears still made it into the book along with a few squirrels, some rabbits, assorted birds and a quirky crow named Mo. 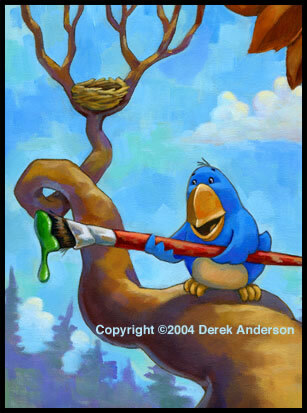 • The very first concept painting Derek ever did of the character Blue Burt (shown above) was completed in Spring 2004 - more than two years before Blue Burt and Wiggles was published. 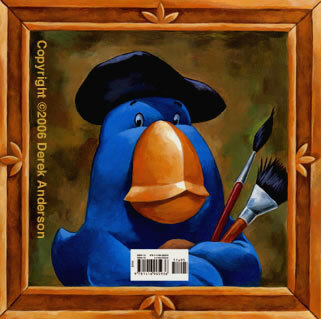 • Derek is constantly sketching and painting new characters that could one day turn up in books. 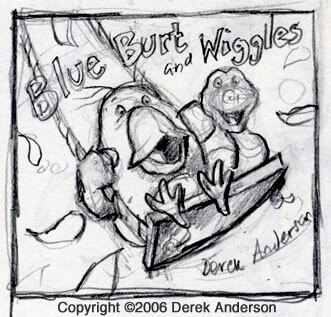 • After painting the initial cover for Blue Burt and Wiggles, Derek discussed it with his editor and they decided that it wasn't the best cover for the book. So Derek painted a second cover. He also had to paint two different covers for Gladys Goes Out to Lunch and Over the River: A Turkey's Tale. Covers are very important, and coming up with the right image is often one of the more difficult parts of making a book. • It's a lot of extra work to paint two covers. Derek would rather just paint one cover. • There is one scene in the book Blue Burt and Wiggles where a rabbit is using snowshoes. Rabbits have actually been known to use snowshoes in Minnesota. • There are three stickers on Blue Burt's suitcase when he returns from his winter away- Ames, Iowa; Etowah, Tennessee; and Sunny Florida. Ames is the city in Iowa where Derek grew up. Etowah is a small town in Tennessee near the base of the Appalachian mountains where Derek was invited to speak at a terrific Young Authors' Conference. Derek had so much fun with the teachers and students there, that he wanted to tip his hat to them. And the last is Sunny Florida where many people (and birds) in Minnesota go during our long, frigid winters. • Derek has hidden himself as a kid in Blue Burt and Wiggles. But no people appear in the book, so you'll have to look hard to find him. The little black glasses he wore as a kid are the giveaway. Derek is also hidden in Gladys Goes Out to Lunch and How the Easter Bunny Saved Christmas. Derek likes to hide himself as a kid in his books because that's when he started writing and drawing. • The painting on the back jacket of Blue Burt and Wiggles was inspired by one of Rembrandt Van Rijn's many self portraits. • Derek has many favorite artists. Besides Rembrandt, Derek loves Picasso and is a huge fan of the impressionists including Monet, Degas and Cezanne. • The editors at Barnes and Noble.com put Blue Burt and Wiggles on their recommended list in September 2006 along with three other books and called it "One of the best books of the summer." • In a fantastic review, Kirkus called Blue Burt and Wiggles "A pure pleasure."